We welcome you to learn more about our programs designed specifically for International Students who want to be a part of the Rutgers Prep Community and prepare for college in the United States. In addition to being New Jersey's first independent school, and one of the oldest in the country, Rutgers Prep has a long tradition of welcoming international students and faculty to our community. Today, Rutgers Prep holds exclusive status as the first independent school to be awarded Non-Governmental Organization (NGO) status at the United Nations. Our global mindset is enhanced by membership with the Network of Complementary Schools, the National Association of Independent Schools and the Council of International Schools. RUTGERS PREP HAS A LONG HISTORY OF WELCOMING international students to the school. International students are well represented throughout the grades, from Kindergarten through Grade 12. Most of the international students who enter in Middle School years (grades 7-8) stay on for Upper School and graduate from Rutgers Prep. Students may apply to any grade (K–12); however, openings in grades 10 and 11 are limited. The full integration of international students in academics, arts, athletics, and school activities gives them a strong foundation in English language skills and a thorough understanding of American culture. International students at Rutgers Prep typically live with local host families. Rutgers Preparatory School's preferred homestay provider is American Homestay Network, a highly respected international Homestay Program. By participating in a Homestay Program, your child will absorb American culture and become involved in a family’s life. A student's English dramatically improves through daily interactions with members of a caring host family. Click Here for more information about the Homestay Program. Q) How large is the International Program at Rutgers Preparatory School? 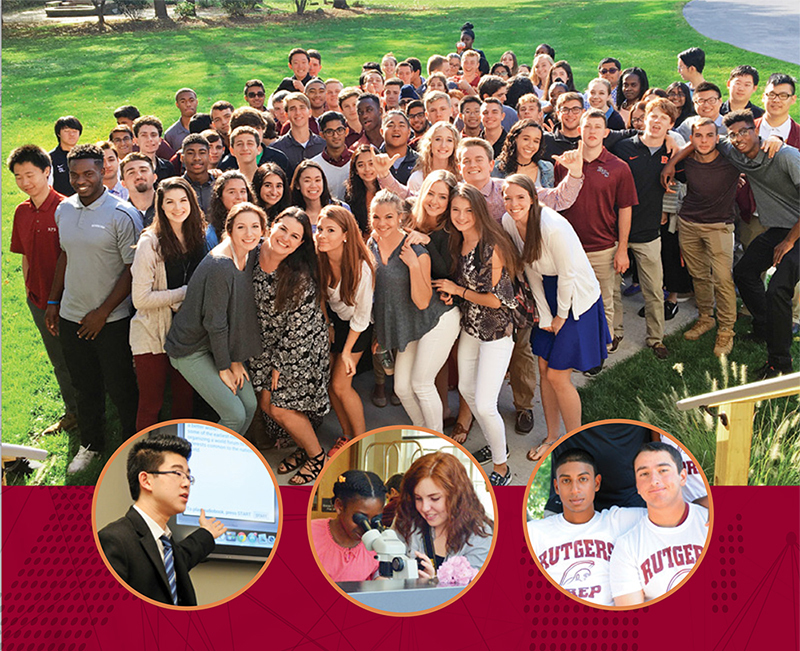 A) Cultural, ethnic and religious diversity is inherent at Rutgers Prep. More than 40 different languages are spoken in our students' homes and a large percentage of our students have one or more parents who were born overseas. Therefore, International Students feel at home at RPS. For the school year 2018-2019, it is expected that approximately 12% of the 388 Upper School Students will be International. Q) Is the admission procedure different for International Students? A) International applicants are expected to follow the guidelines for admission to RPS as outlined in our Procedure for Admission. A TOEFL score should be submitted, prior to an interview. When a face to face interview cannot be accomplished, the interview is conducted via SKYPE. A second SKYPE interview may be requested and a writing sample must be submitted. This might be a graded writing sample from the applicant's school or a timed writing sample during the interview. Q) What is the minimum TOEFL score? A) We require scores to be 85 or higher (for grades 9 & 10) and 100 or higher (for grades 11 & 12). TOEFL Jr. scores must be a minimum of 780 (for grades 7 & 8). Q) What is the minimum SSAT score? A) We require the SSAT for International Students applying to grades 9 through 12 and suggest the SSAT for students applying to grades 7 & 8. We do not have a minimum score expectation at this time. We will consider all scores as we gather data for the future. Q) What if I cannot find a test center for the SSAT near my home? A) If there is not a test center accessible to you, please contact Mrs. Klipstein in the Admission Office to hear about other options. It may be recommended that you find an alternative test. Q) How does your homestay program work? A) International students at Rutgers Prep typically live with local host families. Rutgers Preparatory School's preferred homestay provider is American Homestay Network, a highly respected international Homestay Program. Q) My parents are concerned about safety. What is the process for choosing host families? A) First, families ask to be considered as a host family. After an interview and a rigorous background check, host families are chosen. Families at Rutgers Prep view hosting an International Student as an educational and rewarding experience. Q) When applying to US colleges and/or universities, how do colleges deal with requests for financial assistance from International Students? A) Each college or university has its own policies regarding financial aid. Many colleges restrict grants, scholarships, loans, and financial aid to US citizens. International Students who will need financial support in order to attend college in the US may find that a student's demonstrated financial need, in addition to academic and personal qualities, may be a determining factor. Q) My school session is over in March. May I apply for admission for the Spring? A) No, Rutgers Prep's school year runs from September to June. We do not accept mid-year entry. Q) When will I receive my I-20? A) Rutgers Preparatory School issues I-20s beginning in early May for students who have applied, been accepted, and enrolled with the required initial 10% deposit, passport copy and financial documentation. Interviews at the embassies will be conducted in English as RPS is identified as a school without an ESL program. Click Here for more information about I-20 processing. Q) If I have enrolled for the 2019-20 school year, when should I arrive in New Jersey? A) Click Here for detailed information. Q) What kind of support will I receive when I arrive at Rutgers Prep? A) All students have an academic advisor assigned to them and access to a guidance counselor. Advisors meet with students every Thursday until the student graduates. An International Dean of Students is assigned to the International Program, and develops an ongoing supportive relationship with each student. College Counselors begin to work with the students midway through the student’s eleventh grade year. Additionally, with our low student/teacher ratio, students will find that teachers are accessible for extra help. Q) What do I need to bring with me to the United States to complete my health examination? A) Click Here for information on health and immunization requirements. Q) Whom do I contact regarding my application? Why did you choose RPS? How did RPS help new international students adapt to the new environment? Is it difficult to be accepted at RPS? Is there any ESL program? How many AP courses available? Are there many selective courses? How are the teachers? Are there any after school office hours? How are the hosting families? How is the food and the living environment? How did the hosting families treat the international students? What did you do on weekends? Did the hosting parents give the rides? How many Chinese students are there in RPS? Do you communicate with local students? The academic performances of Chinese students in RPS. Do they participate school activities? Which colleges did they go to after graduation? How is location of the school? Is there any racial discrimination? How are the facilities of RPS? What is the lowest grade RPS accepts international students?